Next week Teena and I are off to Cape Breton for a drive around the island. One of the stops we are making will be at the Fortress of Louisbourg. I thought if I was going to visit the fortress, I should know about its history. So I picked up Endgame 1758: The Promise, the Glory, and the Despair of Louisburg's Last Decade by A. J. B. Johnston. Mr Johnston is a historian with Parks Canada and an acclaimed expert on Nova Scotia, Cape Breton and Louisbourg. 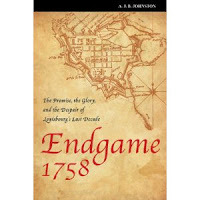 "Endgame is the last stage of a chess match when few pieces are left on the board and a decisive move is to be expected. The penultimate move in the conquest of New France was the 1758 siege of the fortified seaport of Louisbourg on Cape Breton. Both British and French strategists saw that port as the key to France's Canadian colony. The author points out that the French government committed more munitions, ships, and men to Louisburg's defence than were allocated to Quebec City's protection in 1759 (151–6). After the loss of Louisbourg, Q uebec was open to attack, and the seizure of that town brought about the capitulation of New France in 1760." I found this to be a very interesting read. Not only does it tell the story of the history of the last decade of Louisbourg but does so by showing it in the context of the battle for North America. The 1958 siege was no small affair. The British invasion force contained 157 ships and 11,000 soldiers. 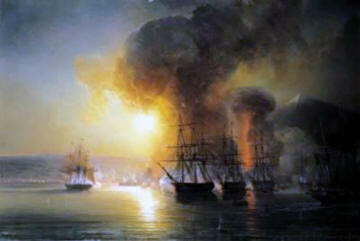 4,000 soldiers protected the fortress along with a number of ships in the harbour. The book is good and the events from 1458 to 1758 are well laid out. The old maps and paintings from that era is a nice touch, although I would have liked to have seen a few more modern maps diagramming the siege as it advanced and some of the larger skirmishes. Even though I am glad the British won, I felt sorry throughout the book for the civilians and soldiers of the fort having to endure daily and nightly bombardments for close to 2 months. James Wolfe name became well-known during this siege. Wolfe, of course, went on to defeat the French in Quebec on the Plains of Abraham. This is an interesting, well-written book on a crucial period of time and major event that shaped Canada and North America to what it is today.